There has recently been a lot of hype over Answers in Genesis opening its latest attraction, the “Ark Encounter.” This life sized “replica” of Noah’s Ark is intend to be a tool to help spread the message of young earth creationism, which would be all well and good if it wasn’t for the fact that young earth creationism is scientifically ludicrous and demonstrably false. Therefore, in this series of posts, I want to go over several of the many lines of evidence which clearly show that a recent world-wide flood did not occur, as well as dealing with some of creationists’ arguments in support of the flood. Before I delve into those arguments, however, I want to use this post to explain why the flood is such an important topic. I often find that skeptics and scientists tend to ignore the flood when debating creationists, but I think that we should actually be focusing on it, because as I will demonstrate, the flood is absolutely essential to creationism and it is the easiest of their positions to convincingly debunk. Note: As always, I want to be absolutely clear that I am not attacking religion. This blog is about science, not religion, so it is not my intention or purpose to debate whether or not there is a god, whether or not Christianity is true, etc. However, any time that a religion makes a claim about the physical universe, it has entered into the realm of science, at which point it comes under my crosshairs. There are plenty of people who both believe the Bible and accept that evolution is true, the earth is old, etc. (see posts here and here). So if you can reconcile your faith with science, then you and I won’t really have any problems. It is not, however, acceptable for you to allow your faith to trump science, and that is what I take issue with. So, for any creationists reading this, I am not asking you to abandon your faith. Rather, I am asking you to take a critical look at what you believe and make sure that it is consistent with scientific facts. Indeed, you already use science to interpret many passages of the Bible, so there is no reason for you not to apply those same hermeneutical principles to Genesis. I often see skeptics wasting their time attacking straw men; therefore, I think that it is important at the outset to state exactly what it is that creationists believe regarding the flood. According to creationists, roughly 4,500 years ago, God grew so tired of mankind’s depravity that he decided to wipe out all humans (except Noah and his family) as well as all land animals (I have to wonder what the animals did to deserve that, but that’s beside the point). 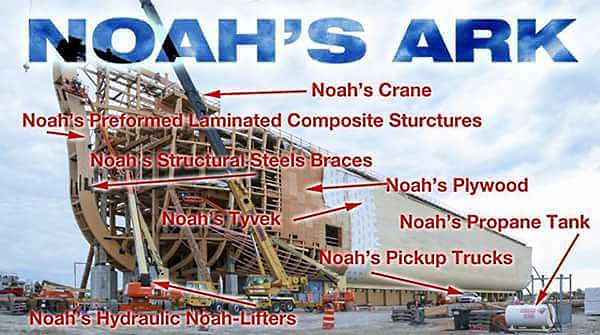 So, God told Noah and his sons to build a massive ark, into which God sent two of each “kind” of land animal (birds, mammals, reptiles, and possibly amphibians depending on which creationist you talk to). God then caused a massive storm during which it rained for 40 days straight and the entire planet was covered in water (even the highest mountains were covered). The flood rapidly buried many plants and animals in sediment, while others tread water before eventually drowning and being buried as sediment fell out of the water. Thus, the flood formed the vast majority of fossils as well as the geological layers that we see today (e.g., all of the layers of sedimentary rock that you see at places like the Grand Canyon were supposedly deposited by the flood). In total, the flood lasted for roughly a year, and once it was over, Noah released the animals from the ark, and they went forth to breed and repopulate the earth (and apparently not instantly eat each other). That may sound simple, but there are several crucial points that need to be emphasised. First, creationists believe that all of the major kinds of land animal were alive prior to the flood and were included in the ark. So ever major group of animals that has ever lived (including dinosaurs) was alive before the flood and was included in the ark. That is going to become really important in coming posts. Second, you have to understand what creationists mean by the term “kind.” According to them, Noah did not actually have two of each species on the ark. Rather, he had two of each kind on the ark. To them, a “kind” is roughly the same as the scientific term “family.” Thus, Noah did not have two tigers, two lions, two bobcats, two leopards, etc. Rather, he had two cats, because according to them, the cat family (Felidae) represents one kind. Following the flood, those “kinds” evolved into the species that we see today. This “kind” argument is actually extremely problematic for a number of reasons (for example, as I explained here, it is totally logically inconsistent), but it is nevertheless what they think, and it is important to understand that so that you don’t commit a straw man fallacy. In other words, I often see skeptics arguing that the flood is impossible because two of each of the millions of species of animals that are alive today could not have possibly fit onto the ark, but creationists don’t think that all of the species were there; rather, they think that all of the kinds were there. I have seen a lot of different estimates from them regarding how many “kinds” would have been present, but the numbers are usually less than 30,000. Again, you’re welcome to debate this notion of kinds, and in later posts I will show why two of each “kind” could not possibly have produced all of the species that we see today, but it is nevertheless what creationists believe, and you have to address their actual beliefs, not straw men. If you want to debate creationists, you have to understand the flood, because it is a cornerstone of their view. For creationists, a literal world-wide flood is a “get out of jail free” card that they use to dismiss just about any evidence that the earth is old/evolution is true. Ask a creationist why dinosaurs aren’t around anymore, and the answer will be, “they couldn’t survive the environment after the flood.” Ask them where all of the fossils came from if the earth isn’t millions of years old, and they will say, “they formed during the flood.” How did the Grand Canyon form? “The flood.” How did varves form? “The flood.” etc. To be clear, these arguments are horribly flawed and almost all of them commit ad hoc fallacies (more on that in a minute), but the point is that creationists rely heavily on the flood as their means of explaining away scientific evidence. So, by showing that the flood is impossible, you kick out a critical leg of creationism, and you defeat young earth creationism as a whole. In other words, if the flood did not occur, then creationists have no way to explain the fossil record, geology, etc. Beyond the importance of the flood to creationists, there is another really important reason why skeptics/scientists should focus on it. Namely, it is actually falsifiable. You see, many creationist beliefs simply cannot be disproved via science. Take, for example, the notion that God specially created all living things. We can look at the fossil record, genetics, biogeography, vestigial structures, etc. and see that they exactly match the predictions of evolution, but creationists can always respond to that simply by saying, “well God made it that way.” That statement is inherently unfalsifiable, because no matter how closely our observations match the predictions of evolution, it is always possible that for some unknown reason a cosmic being decided to create life in such a way that it looked like it had evolved. To be clear, that belief is not even remotely rational (in fact it commits another ad hoc fallacy), but it is not technically falsifiable because it invokes the supernatural, and the supernatural is outside of the realm of science. In contrast, a literal world-wide flood is falsifiable because it would have been physical. Although creationists argue that God caused the flood, they generally argue that he simply triggered it, and the flood itself was an entirely physical event. As such, it is entirely within the realm of science and we can test it and potentially falsify it. In other words, if the flood occurred, then it should have left behind distinct pieces of evidence, so we can look at the evidence and see if it matches the predictions of the flood. This makes the flood a much better target for debate than creationism more generally. Ad hoc fallacies are one of the most common tactics used by creationists, and you will see them a lot throughout this series, so I want to spend a few minutes explaining what they are and how to spot them. These fallacies are generally responses to arguments rather than arguments themselves, and they have two key characteristics. First, they are designed entirely to plug a hole in an argument. In other words, they aren’t part of a broad conceptual framework nor are they things that you would intuitively expect. This brings me to the second key characteristic: you wouldn’t accept an ad hoc argument unless you had already accepted position that it was designed to save. In other words, they are invented solutions, and there is no reason to accept them other than that they let you maintain a view that you are fond of. If you are familiar with the literary construct known as “deus ex machina,” this is basically the debate equivalent. It is an unsupported solution that is pulled out of thin air. Let me give you an example. Suppose that someone claims that a ghost is reliably being encountered in a certain house. So I go to the house with the person several times and never detect anything that could possibly be considered to be a ghost. When I ask my guide why this supposedly frequent ghost never shows up when I’m there, he/she responds, “it doesn’t like to come out in the presence of skeptics.” Do you see how that works? There is no logical reason to accept that response. It is not something that you would intuitively expect to be true. Rather, it is a made-up solution that does nothing other than “solve” a problem in the ghost hunter’s position, and it is a solution that I would never accept unless I was already convinced that ghosts were real (this is very similar to question begging fallacies, and they often occur simultaneously). This example also illustrates another common characteristic of ad hoc fallacies. Namely, they are often impossible to disprove. In other words, the claim that the ghost only shows up around believers is impossible to properly test, because people who weren’t already convinced that the ghost was real would need to be there to unbiasedly confirm or refute its existence. Creationists commit this fallacy all of the time, so you should watch out for it, and there are two easy tests to detect it. First, examine whether or not a given response is backed up by actual data. For example, to explain the size of current coral reefs, creationists often claim that in the past they grew at many times their current growth rate. The problem is that there is absolutely no evidence that such a growth rate occurred or is even physically possible. Thus, this is a made-up solution. The second test is simply to ask yourself whether or not someone would accept that response if they were not already convinced of the thing being defended. For corals, the answer is again a resounding “no.” There is no scientific reason to think that corals used to grow substantially faster than they do now, so the only reason that anyone would ever accept that response is if they already thought that the flood was true/the earth was young, and they wanted to maintain that belief. Now that we have the important introductory material out of the way, we can start on the actual arguments themselves, and there are many of them. In coming posts, I will be explaining the fossil record and geology, varves, more details on corals, genetics, and multiple other lines of evidence which clearly show that a world-wide flood did not occur. In addition to refuting the flood, many of these arguments also provide strong evidence that the earth is old and/or the theory of evolution is correct. If you are a creationist reading this, then I have just one simple request for you: I want you to seriously consider the possibility that you might be wrong. Many creationists, like Ken Ham, openly admit that no amount of evidence will ever make them change their minds, and if that is your position, then there is really no point in you reading any further. If, however, you a really interested in knowing what is accurate and factual, then I encourage you to lay aside your preconceptions and carefully consider the evidence and logic that I will be presenting. If you are impatient and don’t want to wait for my posts, I recommend reading Moore. 1983. The impossible voyage of Noah’s Ark. Creation Evolution Journal 4:1–43. It is an excellent essay on many of the problems with the flood story. This entry was posted in Science of Evolution and tagged ad hoc fallacies, creationism, evidence of evolution, logical fallacies, theistic evolution. Bookmark the permalink. I find the language that many in the media use to be the sort of thing that the fictional Perry Mason always seemed to be saying, “Assumes facts not in evidence”. In this case, calling this building a “replica” seems to be assuming that there ever was such a ship as an ark. Sorry, no historical evidence exists and given that there is no evidence of a flood for which such an ark was to navigate, we can’t call a such a building a “replica”. Rather is a loose model of a fictional ship.